In addition to draining a program-record 90 three-pointers this season, junior guard Levar Wiliams has the ability to take the ball to the paint. With his team struggling at home against nonconference foe Salem last Monday, Jeremiah E. Burke High star LeVar Williams had to get creative. The 6-foot junior from Hyde Park faced a “box-and-one” defense throughout the contest, but saw an opening in transition with the score tied, 23-23, midway through the second quarter. When two Salem defenders cut off his lane to the basket, Williams crossed to his left, countered right with a dribble behind his back, and elevated seamlessly for one of his seven made 3-pointers in the Bulldogs’ 82-70 victory. That shot — part of a 17-0 run that allowed Burke to gain control of the game — was executed with the highest degree of difficulty, but Williams has the confidence to hoist those attempts because he’s practiced similar scenarios in an empty gym. Despite drawing shadow coverage and double teams throughout the season, Williams is averaging 21.2 points per game and may have already set a single-season school record with 90 3-pointers through 17 games. Combine a natural passion for basketball with direction from a coaching veteran and you have a recipe for success. In 2014, Sean Ryan gave up his job as an assistant coach at Central Connecticut State University to become the head coach at Burke. Burke was the first school in the state to come out of “turnaround” status by the department of education. 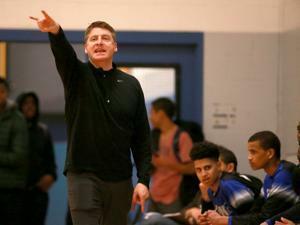 And the boys’ basketball program quickly turned around under the guidance of Ryan, who has also coached at Holy Cross, the College of Charleston and Boston University. Ryan continues to help athletes on and off the court; both Williams and senior forward McCarthy Akinkouye credit their coach for keeping them on track toward a potential collegiate scholarship. “I feel like I’ve improved all around with my work ethic on the court and in the classroom too,” said the 6-foot-4 Akinkouye, who transferred to Burke from West Roxbury High last year. The coach is in contact with his players on a daily basis and is always exhorting them to do right in the classroom. “Developing good and consistent habits is the goal and that transitions over to good basketball habits,” said Ryan. 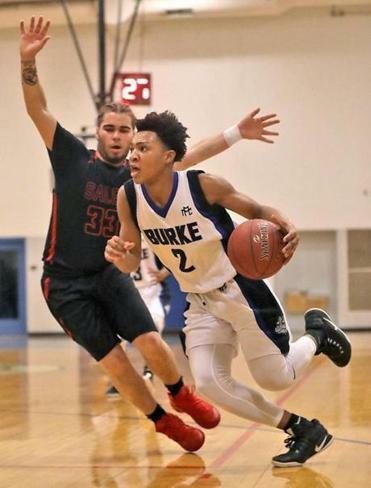 Burke (16-1) is suddenly a major contender for a Boston City League title because so many players have bought in to Ryan’s system. For Williams, that involves studying nuances of the game in an effort to find openings for his lethal shot, as well his teammates learning how to take advantage of the extra defensive attention paid to the sharpshooter. The end result is a confident and motivated group that believes they can battle incumbent City League powers Brighton, O’Bryant and Tech Boston. And Williams can certainly shoot as well as anybody. He’s connected on at least four 3-pointers in 15 games this year and netted a season-high nine treys over three quarters in a win over Boston English on Jan. 11. Williams, who averaged 15 points per game as a sophomore, has clearly made a leap this year thanks to his intrinsic drive and Ryan’s instruction. “As a coach, when you see the talent and passion in a kid, you always want to work with them,” said Ryan. Sean Ryan has directed the Burke boys’ basketball team to a 16-1 start. ■ Arlington continued its dominance over the Middlesex League with its 30th consecutive league victory, a 60-52 decision over Reading last Friday. The Spy Ponders (13-2) have also recorded 41 consectutive regular season wins at home dating back to February, 2014. ■ With his 1,735th career point in a win over Swampscott last Tuesday, Everett senior guard Ghared Boyce surpassed Shannon Crooks (’97) as the Crimson Tide’s career scoring leader. ■ On Super Bowl Sunday, Newton North toppled a third undefeated team this season, thwarting Brockton in a 58-40 road win. The top-ranked Tigers have won 12 of their last 13 since starting the season 1-2. ■ TechBoston Academy blitzed Needham for a 55-54 nonconference win last Friday, completing an impressive week for the D2 South contenders that included wins over City League rival O’Bryant and D1 South power BC High as well. TechBoston, Apponequet and Bishop Stang stand alone as the remaining undefeated teams in Eastern Mass. Cam Andrews, Stoughton — With 36 points and a game-winning 3-pointer, the senior was the hero in the Black Knights’ 69-66 victory over Milford last Friday. Julio Fulcar, Watertown — The Raider senior produced 14 points, 5 assists and a game-high 7 steals to lead his team in a key 61-57 Middlesex League win over Woburn last Tuesday. Alex Rivera, Lowell — The outcome of Lowell’s 72-58 win over Central Catholic to take over first place in the Merrimack Valley Conference was never in doubt thanks to Rivera’s 22 first-half points. Adam Seablom, Apponequet — The senior guard netted a team-high 26 points as the Lakers (14-0) outlasted Old Rochester last Wednesday to remain undefeated. Billy Whelan, Hamilton-Wenham — In a rare statiscal achievement, the junior guard produced a quadruple-double with 15 points, 11 rebounds, 11 assists and 10 steals to lead the Generals (12-2) past Cape Ann League foe Manchester Essex, 66-58. ■ Tuesday, Newton North at Brookline, 4 p.m. — The top-ranked Tigers (13-3) head back into conference play to face the surging Warriors (10-4), who recently handed Burke their first loss of the season. ■ Tuesday, New Bedford at Brockton, 6:30 p.m. — The Boxers (15-1) look to rebound from their first loss of the season in a pivotal Big Three Conference showdown against the talented Whalers (11-3). ■ Thursday, BC High at Hanover, 6:30 p.m. — After dropping three straight to elite opponents, the Eagles (9-5) face another tough challenge in Hanover against the defending D3 state champions. ■ Friday, Franklin at Mansfield, 6:30 p.m. — These perennial powers will battle for first place in the Hockomock Kelley-Rex Division. Franklin (14-1, 11-1) defeated Mansfield (15-2, 11-1) at home on Jan. 12. ■ Friday, Everett at Lynn English, 7 p.m. — In their first season as a member of the Northeastern Conference, the Crimson Tide (14-1, 11-0) are shooting to wrestle first place away from Lynn English (14-1, 11-0) in a key road tilt.